Shelby Fredericks surveys the field. The senior attacker wants the Cats to stick with what they have been doing against Stony Brook. After avenging last year’s loss against No. 13 USC, No. 10 Northwestern looks to continue its revenge tour against No. 1 Stony Brook on Saturday. With a win over the Seawolves (3-0), the Wildcats could win their third game against a team they lost to in the 2017 regular season. But not only did NU (4-1) lose to Stony Brook in the 2017 campaign, they were also bounced by them in the second round of the NCAA Tournament. Coach Kelly Amonte Hiller said that it will be a great opportunity for the Cats to get payback. Still, NU players said they know the Cats can’t let their emotions get in the way of their preparation. Beyond their No. 1 ranking, the Seawolves also have several important starters returning, including senior attacker Kylie Ohlmiller, who set the NCAA record for points and assists last season. 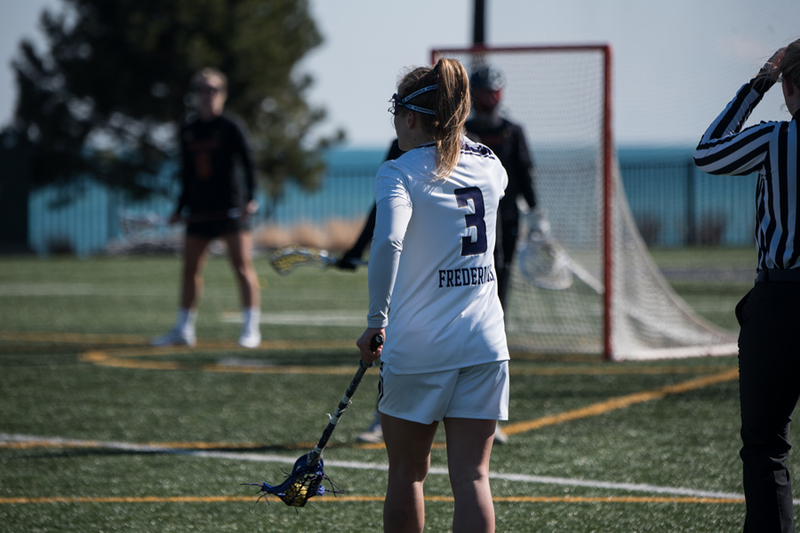 Senior attacker Shelby Fredericks added that Ohlmiller is very efficient with the ball, which helps the offense run smoothly. Amonte Hiller echoed Fredericks’, saying that as a team, Stony Brook moves the ball well while using its athleticism and speed. She added that it will be up to the Cats’ defense to step up and make stops. Amonte Hiller said that the most important piece of Krupnick’s play this season has been her consistency. Along with Krupnick, Amonte Hiller said that other freshmen have been playing big roles this season, whether on the field or supporting from the bench. The freshmen have given NU more depth and athleticism to go up against tough, ranked opponents, the coach added. Regardless of the competition, Fredericks said that the Cats have to treat this game like it’s any other game if they want to come out on top.